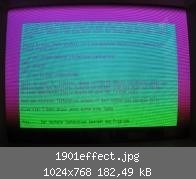 Clickbait aside though, I thought that I might share with you a screen effect that was created by the user macbacon on the c128 vdc and posted on a German C= forum, just incase you are unaware of it. Now my German isnt great, but what I can figure is that it relies on a fault that the C=1901 monitor exhibits and so is not practical as it may not work on other monitors. Those of you who are a bit more fluent in German could possibly elaborate on anything I may have missed. This effect works by changing register 34 (Display Enable start) from 125 to a lower value like 115. I can also force the effect on my 1901 by just turning the knob to shift the picture to the right. The usual value for Display Enable Start is 125, which means the display is enabled at position 125 of a raster line. On PAL you have 128 char-positions (register 0 = 127) and on NTSC 127 (register 0 = 126). As Hydrophilic calculated back on commodore128.org the VDC has a 16 Mhz Dot Clock. For NTSC you have 16000000 Hz / (127 * 8) = 15748 Hz which is the horizontal NTSC frequency and for PAL: 16000000 / (128 * 8) = 15625 Hz which is the horizontal PAL frequency. Of these 127 or 128 char-positions 80 are used on a regular text screen. Display is disabled at position 100 and re-enabled at the far right at position 125 (in anticipation of the next line). Apparantly the 1901 gets out of whack and displays strange colors if you re-enable the diplay during the flyback-phase. Nothing you can reproduce on other devices or sensibly use in a demo. Thanks for the technical info tokra! I'm gonna try it on my TV to see if anything happens... but I suspect you are right (no new colors). Register 35 basically extends the right hand border so what we are looking at is a very bad fault on that particular monitor rather than any sort of programming trickery.